My name is Jessica Jennings and I founded Ma Yoga in 2009 because I loved being part of a community of moms-to-be when I was pregnant, and I longed to have a continuation of that support once I became a mom. Our community of yoga teachers, birth and mom practitioners, mom and moms-to-be has been there for over 5,000 mamas so far! I also have discovered in teaching Prenatal Yoga for 15 years that this special time in our lives is full of opportunities to discover who we truly are as human beings: and step into our innate flow of power, wisdom, and nurturing energy. With a little guidance and inspiration, I believe we can learn to look at every challenge as a way to grow and evolve; and every time we need to let go of a part of our old identity, an opportunity to co-create ourselves and our lives in a more authenic way..
Ma Yoga teachers partner with birth and mom businesses to offer Prenatal Yoga and Mom + Baby Yoga claases,, primarily in the Los Angeles, Orange County, and South Bay Areas – and we’re growing fast as more teachers become trained and start “MAma Circles” in their own neighborhoods. Our beliefs about the birthing process arise from yoga. According to yogic tradition in its most mature period (800 CE), we are each expressions of divine consciousness. Not only that, but everything we can see and experience – our thoughts, our bodies, the whole world around us- is actually Consciousness, or nature, or energy, or whatever we choose to call it. According to yoga, there is no force outside of ourselves pulling the strings: we are free to respond to what’s called the evolutionary impulse within us; and when we do, we find ourselves manifesting enjoying more truth, beauty and goodness. That said, how could one way of birthing be the “right way” and one be “wrong”? We can find the goodness of Consciousness anywhere. For us, any birth can be a beautiful experience of growth and connection. It’s about moving forward with growing awareness; making educated choices; feeling supported and loved and participating fully in the choices. Ma Yoga is about learning how to align with what is right for you and your family. We encourage you to educate yourself about your options, surround yourself with people you trust, and then enjoy the journey, knowing you have everything you need within you to experience truth, goodness and beauty in whatever happens. Through practicing the age-old breathing, meditation, and philosophy of yoga, we can learn to be our divine Self, no matter what the conditions. Ma Yoga classes help us create real connection with other moms and moms-to-be in our own neighborhoods, so you have someone to call and share your ups and downs; someone who understands that sometimes getting baby down for a nap represents a huge victory! Once you have your baby and doctor gives the ok to exercise, you cancome right back for a Mom Yoga + Baby class, see your friends and introduce the new love of your life to everyone. It’s really more for you than for baby! Pregnancy is a time when we need to access and magnify our strength. We carry a bowling ball around 24/7, and on top of that, pregnancy hormones cause the joints to weaken. Physically, Ma Yoga classes help get us out of pain and into feeling great. Ma Yoga classes help us connect to our strong, spacious core, wherever we are in the journey: whether we just missed our period or we’ve been a mom for months. All of our teachers are trained in therapeutic, alignment based yoga, so the way that we teach the poses is actually similar to physical therapy for the body. We strengthen the joints rather than over-stretch them; and teach how to stabilize the lower back and shoulders so holding baby won’t lead to misalignments and pain. For this reason, the sooner your start practicing yoga – both physically, to know how to keep your shoulders and back out of pain, and energetically, with the divine feminine within – the easier it will be to access later when it gets even harder. Ma Yoga teachers believe that we can use the 9 months to also co-create with nature – not only to make a baby, but also to make the mama to this baby. 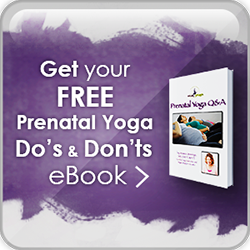 In prenatal yoga, we open up to our deepest intentions about who we want to be as a mama, and learn to put them into action. In Mom Yoga+Baby, we are going to do a lot of work to re-connect to our center, strengthen, and nourish our bodies so we can give all that baby needs and not be depleted. We all have habits and patterns we have wanted to change for a while – whether they are related to eating, exercise, or how we think of ourselves and interact in the world. You might have tried to change these patterns, and even had some success. But you probably noticed how near impossible it is to change deeply ingrained ways of being when our only motivation is our own personal happiness. When we are becoming a mom, we have a whole new motivation to change. We realize that this little being will learn everything – how to breathe, how to move, how to think – just by being around us. Suddenly, even the way we think starts to matter more. Pregnancy gives us great motivation to make these changes in our lives, and Ma Yoga is there to offer not just yoga but yoga lifestyle tips to support the flow of prana, or life force, within you. These “anchor practices” are simple, but can be deeply nourishing not only physically, but mentally, when we do them consistently. We start the day on the right foot. We are creating a global, growing online community of MAmas. We have birth and motherhood preparation, yoga and a nurturing community . And lots more for new moms, like breastfeeding tips and herbs, in our New Mom Guide (check out our online offerings at Ma Yoga Living Room). 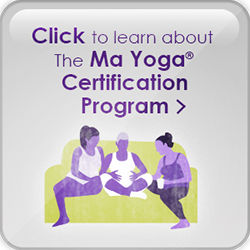 Ma Yoga is a tribe of yoga teachers who want to make a difference in women’s lives, and who believe we can be better in community. When we are part of a kula, or heart-filled community, we feel supported even when we’re alone. This is not a community that tries to get people to become like each other. It’s a community that honors each person’s unque path to authenticity. So whatever your body size, color, shape, experience, or place in the journey you are, you will feel welcomed in our classes. If you read the Birth Stories our students have submitted, you’ll notice how different each one is, but how with yoga, each one has this unique beauty to it. With yoga we learn to breathe into our challenges, to fully participate in responding to all that arises, and to know how to access support from outside and within ourselves. When we awaken to the true nature of our powerful, wise and loving Self, we affect our whole family. When we affect our families, we affect our communities. When we affect our communities, we change the world. I wish you many blessings of self-discovery and connection on your journey.